The Pink Monogram : Welcome to The Pink Monogram, home of Monogrammed Gifts and the exclusive creators of the Original Monogrammed Clogs. (Read More). 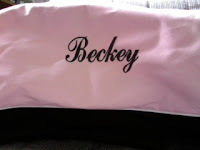 Ever since I was a little girl I have always wanted a pink monogrammed over night bag. But when I was a kid just a plain pink over night bag was about a $100+ (not) including the monogram. As a child growing up in a house of 6 my mom could not afford such things as that. But at The Pink Monogram you can get your own monogrammed Sports Bag at a extremely low price! for just $35.00 you get a huge sports bag/overnight bag with any monogram, design and color. I can use this sports bag as a sports bag or as a overnight bag because of how big it is. The sports bag is 24" x 10" x 16". 600-denier polyester with PVC coating means you won't have to worry about scratching, and it means easy cleaning for sports clothes, or damp clothes from swimming. I will be using this sports bag as a over night bag because I easily be able to put 3-4 pairs of jeans, 6 shirts, and other needs I might need to take along. each side of the bag comes with 2 loop handles for easy carrying or you have the option of a removable shoulder strap. The inside has a zip pocket for stashing your valuables such as money, wallet, watch, cell phone and more. The main compartment has large U-shaped opening with two zipper pulls, side pocket, Black bottom with white accent lining. The The Pink Monogram has tons, and tons of amazing monogrammed products such as shopping bags, shoes, wedding, jewelry, bath & body and more. The Pink Monogram gifts would make a great Christmas, Birthday, or a just because gift. You can also order products for your baseball, softball, and football team. ♥ I receive no monetary compensation for this review. I was provided a sports bag to try and give my honest opinion.